The Ecuadorian government is in the process of auctioning off all the country’s remaining virgin rainforest, 8 million acres, to oil companies. Oil drilling is also planned in the Yasuní National Park, which is not only a UNESCO World Biosphere Reserve and the most ecologically diverse spot on the planet, but home to the last two indigenous tribes in Ecuador living in voluntary isolation. The repercussions of oil drilling in these areas of pristine rainforest would be environmentally and culturally catastrophic, as has been witnessed in areas of Ecuador’s Amazon already being exploited, where more oil has been spilled than in the Exxon Valdez disaster. Communities who live sustainably and depend on the rainforest and its rivers now live next to toxic waste pits and streams laced with heavy metals, suffering from hugely increased rates of cancer, childhood leukaemia, miscarriage and skin lesions. The destruction of Ecuador’s Amazon isn’t just a local issue. With global carbon dioxide levels increasing every day, the Amazon’s role as the lungs of the planet becomes ever more vital. Its fate affects us all. The innocuously titled XI Oil Round is an auction, selling all of Ecuador’s remaining virgin rainforest, 8 million acres, to oil companies. Defying Ecuador’s own 2008 constitution and the wishes of the seven indigenous tribes who live there, the auction of one of the planet’s most bio-diverse regions has already begun. 28th November 2013 was the deadline for oil companies to submit bids for the 13 available oil blocks. The government map below shows the location of the Amazon basin in Ecuador and the oil blocks in the Northern Ecuadorian Amazon which are already licensed for exploitation, including the Yasuni ITT oil field. 13 blocks (in orange) were open for bidding on 28th November. Three blocks (in green) were pre-assigned to the state-run oil company Petroamazonas. Five blocks (in white) have been temporarily suspended from the auction due to indigenous resistance. On the submission deadline, only four blocks received bids. 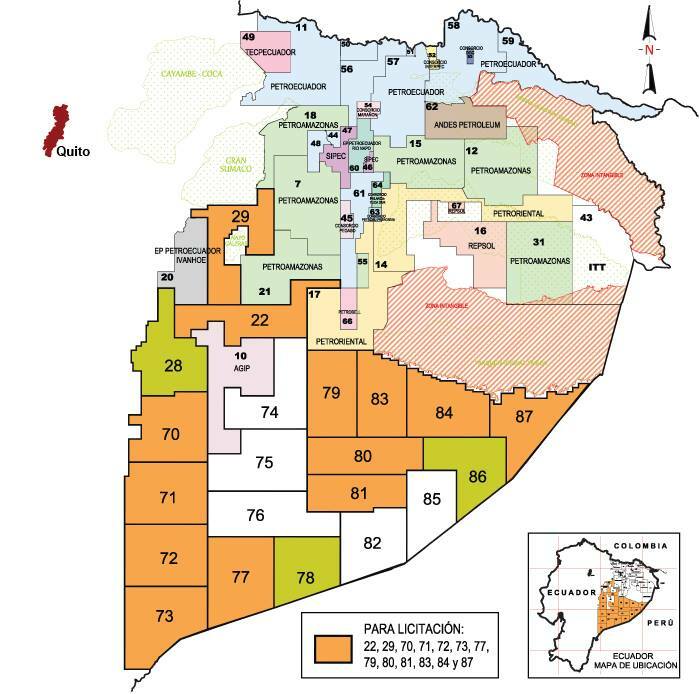 A Chinese company, Andes Petroleum Ecuador Ltd, bid for blocks 79 and 83. Repsol, from Spain, bid for block 29. An Ecuador/Chile/Belarus joint venture, Consorcio Petroamazonas, bid for block 28. Winning bids on these four blocks will be announced in March 2014. Shortly after the four bids were received, the Ecuadorian government announced that the remaining blocks would all be allocated to the national oil company, Petroamazonas, meaning that all of Ecuador’s remaining virgin jungle will soon be exploited. The Ecuadorian government has promised that exploitation will be undertaken with “environmental and social responsibility”. If this is the case, can the oil be extracted without affecting the tribal peoples’ land and way of life; is there a happy medium? Perhaps a good way to answer this question is to look at areas and communities already living with the effects of oil exploitation in Ecuador. Oil has been extracted for decades in Ecuador’s northern Amazon region, which has been catastrophic for both people and the environment, with major spills occurring as recently as June of last year. Communities who live sustainably and depend on the rainforest and its rivers for survival have been left permanently with no drinking water, unable to wash or fish in the rivers, due to contamination. Because they now live next to toxic waste pits and streams laced with heavy metals, they have hugely increased rates of cancer, childhood leukaemia, miscarriage and skin lesions. Communities who have tried to resist the exploitation of their land have been subjected to brutality by government troops. Now, the entire southern region of Ecuador’s Amazon, estimated to be 85% virgin rainforest, looks likely to suffer the same fate. Yasuní National Park is an area of the Amazon recently found by scientists to be the most bio-diverse on the planet and probably unmatched by any other park in the world for total numbers of plant and animal species. A UNESCO World Biosphere Reserve, Yasuní has more than 1,300 species of animals and 100,000 species of insects. 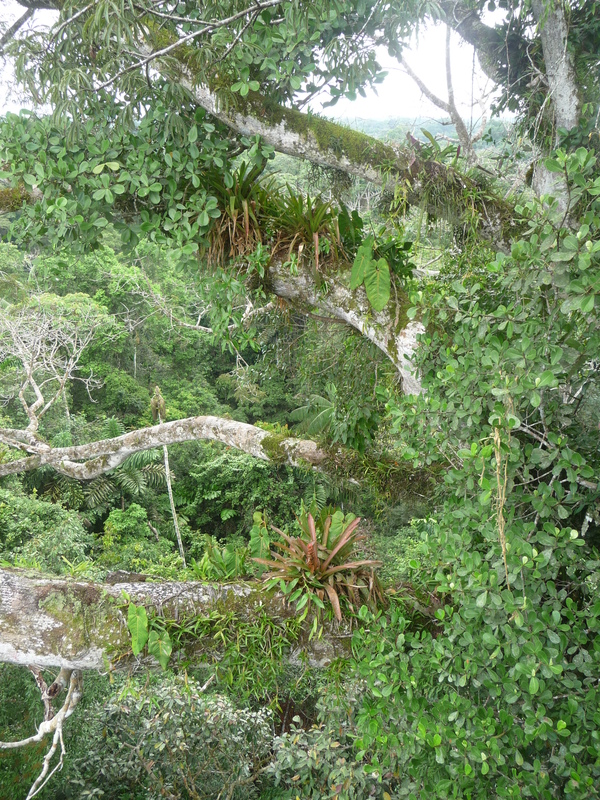 One hectare of its rainforest has as many as 655 tree species; more than all of the US and Canada combined. The park is also home to indigenous peoples with legally recognised territorial rights (Waorani) and the two last known groups living in voluntary isolation in Ecuador (Tagaeri and Taromenane). These nomadic tribes have no contact with the outside world and very little is known about their way of life. “The territories of the peoples living in voluntary isolation are an irreducible and intangible ancestral possession and all forms of extractive activities shall be forbidden there. The State shall adopt measures to guarantee their lives, enforce respect for self-determination and the will to remain in isolation and to ensure observance of their rights. The violation of these rights shall constitute a crime of ethnocide, which shall be classified as such by law”. In fact, the decision to drill in Yasuni National Park is unconstitutional in several ways. As well as violating the rights of uncontacted peoples, the exploitation would also disregard the rights promised to Pachamama (Mother Earth). One reason for the lack of international donations to the Yasuní fund is that the government’s credibility was undermined when it announced its plans to auction off all the virgin rainforest in the southern Amazon region with the XI Oil Round auction. Indeed, one international NGO described the Yasuní ITT Initiative as “a fig leaf to build political capital while planning for more destruction”. This view was backed up when the Guardian newspaper published an article revealing that the government was in negotiations with a Chinese oil company to drill in Yasuní even whilst seeking donations from the international community to protect it. Ecuadorian society at large has mobilized to reject oil drilling in Yasuní and to demand their constitutional right to a public consultation. In response, the government has promised to hold the consultation if civil society presents 600,000 signatures to Congress by mid-April. It’s a huge challenge, but it may be the only way to save the planet’s most bio-diverse region: recent polls suggest that up to 90% of Ecuadorians would vote to keep Yasuní oil underground, despite a savvy PR campaign from the government. In an advert played regularly on the several state-controlled television channels, the government liken drilling in the national park to a baby getting vaccinated; a small scratch which is painful for a second but goes on to benefit the whole body. A signature collection by part-time volunteers is already under way. However, the government has set extremely stringent rules about the validity of signatures (e.g. if there is one smudge of dirt on a page, or one person signs in the wrong colour ink, all the signatures on that page are invalid). More volunteer signature collectors are desperately needed. While drilling in the Ecuadorian Amazon from 1964 to 1990, Texaco – which merged with Chevron in 2001 – deliberately dumped more than 18 billion gallons of toxic wastewater, spilled roughly 17 million gallons of crude oil, and left hazardous waste in hundreds of open pits dug out of the forest floor. To save money, Texaco chose to use environmental practices that were obsolete, did not meet industry standards, and were illegal in Ecuador and the United States. The result was, and continues to be, one of the worst environmental disasters on the planet. Contamination of soil, groundwater, and surface streams has caused local indigenous people and farmers to suffer a wave of mouth, stomach and uterine cancer, birth defects, and spontaneous miscarriages. 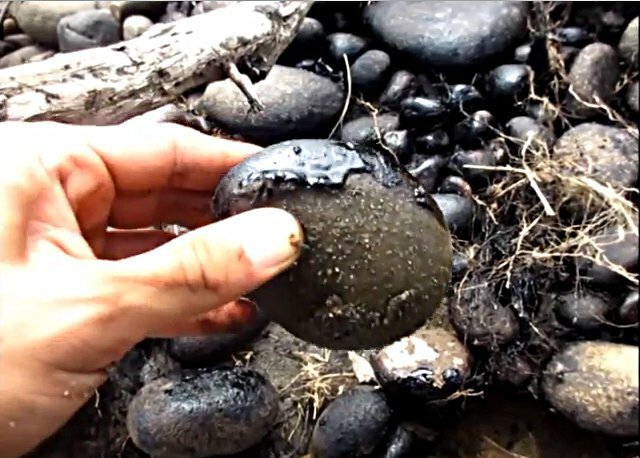 Chevron has never cleaned up the mess it inherited, and its oil wastes continue to poison the rainforest ecosystem. Chevron has been found guilty by Ecuadorian courts and ordered to pay $9.5 billion. The company is now running from an international legal dragnet to force the company to pay for the vast task of cleanup and remediation of the Ecuadorian Amazon jungle. Lawsuits have been filed in Canada and Brazil to seek seizure of Chevron’s assets for this purpose, and more lawsuits in other nations are expected soon. El gobierno ecuatoriano está en el proceso de subastar todos los restantes de la selva virgen que queda en el país, 3 millones de hectáreas, a las empresas petroleras. La extracción de petróleo también está prevista en el Parque Nacional Yasuní. El Parque que no es sólo una Reserva mundial de la Biosfera de la UNESCO; sino el lugar más diverso ecológicamente en el planeta; y el hogar de los dos últimos pueblos indígenas en Ecuador que viven en aislamiento voluntario. Las repercusiones de la extracción de petróleo en estas áreas de bosque tropical serían ambientalmente y culturalmente catastróficas, como se ha visto en las zonas de la Amazonía Ecuatoriana ya explotadas, donde más petróleo ha sido derramado que el desastre del Exxon Valdez. Las comunidades que viven de manera sostenible y que dependen de la selva y sus ríos para ahora viven junto a piscinas de desechos tóxicos y corrientes mezcladas con metales pesados, han aumentado enormemente las tasas de cáncer, leucemia infantil, aborto involuntario y lesiones en la piel. La explotación de la Amazonía Ecuatoriana no es únicamente un asunto local. Con los niveles de dióxido de carbono creciendo cada día en el mundo, el rol de la Amazonía como pulmón del planeta se hace cada vez más vital. Su destino nos afecta a todos nosotros. El inofensivo título de XI Ronda Petrolera es una subasta, vendiendo todos los restantes de selva virgen del Ecuador, 3 millones de hectáreas, a las empresas petroleras. En desafío a la Constitución Ecuatoriana de 2008, y los deseos de las siete nacionalidades indígenas que viven allí, la subasta de una de las regiones con mayor biodiversidad del planeta ya ha comenzado. El 28 de noviembre de 2013 fue la fecha límite para que las empresas petroleras presenten sus ofertas para los 13 bloques de petróleo disponibles. El mapa gubernamental arriba muestra la ubicación de de la cuenca amazónica en Ecuador y los bloques de petróleo en la Amazonía ecuatoriana del Norte que ya tienen licencia para su explotación, incluyendo el campo petrolero Yasuní ITT. 13 bloques (en naranja) se encontraban abiertos a la licitación el 28 de noviembre. Tres bloques (en verde) han sido pre-asignados a la empresa petrolera estatal Petroamazonas. 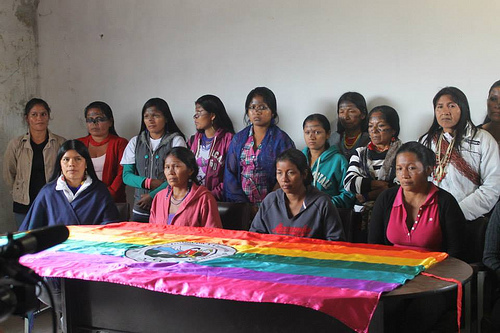 Cinco bloques (en blanco) se han suspendido temporalmente de la subasta debido a la resistencia indígena. En el plazo de presentación, sólo cuatro bloques recibieron ofertas. Una empresa china, Andes Petroleum Ecuador Ltd., presentó una oferta para los bloques 79 y 83. Repsol, de España, presentó una oferta para el bloque 29. Una empresa conjunta Ecuador / Chile / Bielorrusia, Consorcio Petroamazonas, hizo una oferta para el bloque 28. Las ofertas ganadoras en estos cuatro bloques serán anunciadas en marzo de 2014. Poco después de que se recibieron las cuatro ofertas, anunció el gobierno ecuatoriano que los bloques restantes serían todos asignados a la empresa petrolera nacional, Petroamazonas, lo que significa que todos los restantes de la selva virgen de Ecuador pronto serán explotados. El gobierno ecuatoriano ha prometido que la explotación se llevará a cabo con “responsabilidad ambiental y social”. Si este es el caso, se puede extraer petróleo sin afectar a la tierra y la forma de vida de los pueblos indígenas, ¿hay una medida justa? Quizás una buena manera de responder a esta pregunta es mirar a las áreas y comunidades que ya viven con los efectos de la explotación petrolera en Ecuador. El petróleo ha sido extraído durante décadas en el norte de la Amazonia de Ecuador, que ha sido catastrófico para las personas y el medio ambiente, con grandes derrames ocurridos recientemente, en junio del año pasado. Las comunidades que viven de manera sostenible y que dependen de la selva y sus ríos para su supervivencia han quedado permanentamente sin agua potable, no pueden lavarse o pescar en los ríos, debido a la contaminación. Debido a que ahora viven junto a piscinas de desechos tóxicos y corrientes mezcladas con metales pesados, han aumentado enormemente las tasas de cáncer, leucemia infantil, aborto involuntario y lesiones en la piel . Comunidades que han tratado de resistir a la explotación de sus tierras han sido sometidas a la brutalidad de las tropas gubernmentales. Después de hoy, toda la región sur de la Amazonia de Ecuador, estimada en 85 % de la selva virgen, va caminando al mismo destino . El Parque Nacional Yasuní es un área de la Amazonía recientemente descubierto por los científicos como el más biodiverso del planeta. Yasuní es probablemente inigualable a cualquier otro parque en el mundo por el número total de especies de plantas y animales. Una Reserva mundial de la Biosfera por parte de la UNESCO, el Yasuní cuenta con más de 1.300 especies de animales y 100.000 especies de insectos. Una hectárea de su selva tiene 655 especies de árboles, más que todos los EE.UU. y Canadá juntos. 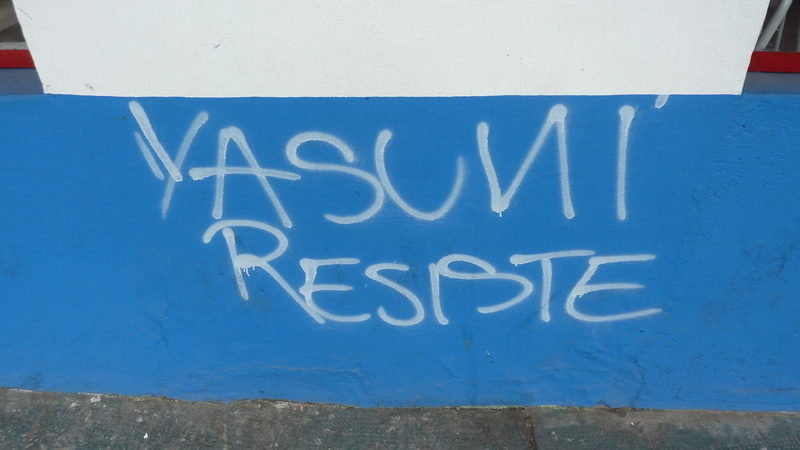 Yasuní es tambien el hogar de los pueblos indígenas con derechos territoriales legalmente reconocidos (Waorani) y las dos últimas comunidades indígenas que viven en aislamiento voluntario en Ecuador (Tagaeri y Taromenane). “Los territorios de los pueblos en aislamiento voluntario son de posesión ancestral irreductible e intangible, y en ellos estará vedado todo tipo de actividad extractiva. El Estado adoptará medidas para garantizar sus vidas, hacer respetar su autodeterminación y voluntad de permanecer en aislamiento, y precautelar la observancia de sus derechos. La violación de estos derechos constituirá delito de etnocidio, que será tipificado por la ley”. De hecho, la decisión de perforar en el Parque Nacional Yasuní es inconstitucional en varios aspectos. Además de la violación de los derechos de los pueblos no contactados, la explotación también desatendería los derechos prometidos a la Pachamama (Madre Tierra). Una razón para la falta de donaciones internacionales al Yasuní es que la credibilidad del gobierno fue socavada cuando anunció sus planes de subastar toda la selva virgen en la región sur de la Amazonía con la XI Ronda Petrolera. De hecho, una ONG internacional describió la Iniciativa Yasuní ITT como “una hoja de parra para construir capital político, mientras se planifica más destrucción”. Este punto de vista fue respaldado cuando el periódico The Guardian publicó un artículo revelando que el gobierno estaba en negociaciones con una empresa petrolera china para perforar en el Yasuní, incluso mientras buscaban donaciones de la comunidad internacional para proteger al mismo. La sociedad ecuatoriana se ha movilizado para rechazar la perforación petrolera en el Yasuní y para exigir su derecho constitucional a una consulta pública. En respuesta, el gobierno se ha comprometido a celebrar la consulta si la sociedad civil presenta 600.000 firmas ante el Congreso antes de mediados de abril. Es un desafío enorme, pero puede ser la única manera de salvar a la región más biodiversa del planeta: las encuestas recientes indican que hasta un 90% de los ecuatorianos votarían para mantener el petróleo del Yasuní bajo tierra, a pesar de una campaña gubernamental de RRPP muy astuta. En un anuncio visto regularmente en varios de los canales de televisión controlados por el Estado, el gobierno compara la perforación en Yasuní con la vacunación de un bebé; un pequeño rasguño que es doloroso por un segundo, pero que beneficia todo el cuerpo. Una colección de firmas por los voluntarios a tiempo parcial ya está en marcha. Sin embargo, el gobierno ha establecido reglas muy estrictas acerca de la validez de las firmas (por ejemplo, si hay una mancha en una página, o una persona firma con tinta de color equivocada, todas las firmas en esa página no son válidas). Se necesitan desesperadamente más coleccionistas voluntarios de firmas. Durante su perforación en la Amazonía ecuatoriana desde 1964 hasta 1990, Texaco – que se fusionó con Chevron en 2001 – dejó deliberadamente más de 18 mil millones de galones de aguas residuales tóxicas, derramó aproximadamente 17 millones de galones de petróleo crudo, y dejó los residuos peligrosos en cientos de minas a cielo abierto excavado fuera del suelo del bosque. Para ahorrar dinero, Texaco optó por utilizar prácticas ambientales obsoletas que no cumplieron con los estándares de la industria, y eran ilegales en Ecuador y Los Estados Unidos. El resultado fue, y sigue siendo, uno de los peores desastres ambientales en el planeta. La contaminación de las corrientes de suelos, aguas subterráneas y superficiales ha llevado a las personas indígenas y a los agricultores locales a sufrir una ola de cáncer de la boca, del estómago y del útero, defectos de nacimiento y abortos involuntarios. Chevron nunca ha limpiado el desastre que heredó, y sus residuos de petróleo continuarán envenenando el ecosistema de la selva. Chevron ha sido declarado culpable por los tribunales ecuatorianos y ha recibido la orden de pagar $ 9500 millones en compensación. La compañía ahora está huyendo de un esfuerzo legal internacional para obligar a la empresa a pagar por la gran tarea de la limpieza y saneamiento de la selva amazónica ecuatoriana. Se han presentado demandas en Canadá y Brasil para buscar la confiscación de activos de Chevron para este fin, y se espera pronto más demandas en otras naciones.